Though the most elaborate Hindu temples are those dedicated to the worship male deities such as Shiva, Ganesha, Vishnu etc, far greater attention is paid to the propitiation of less august though more powerful and dangerous female deities. 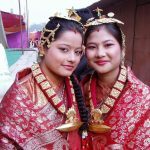 In addition to the popularity of such non-Tantrik female deities as Saraswati, Lakshmi and Parvati, the newars devote a great deal of their ritual activity to the worship of the Devi in one of her many dangerous mature, blood lusting forms (kali, Durga, Ajima, Bhairavi, Taleju etc). 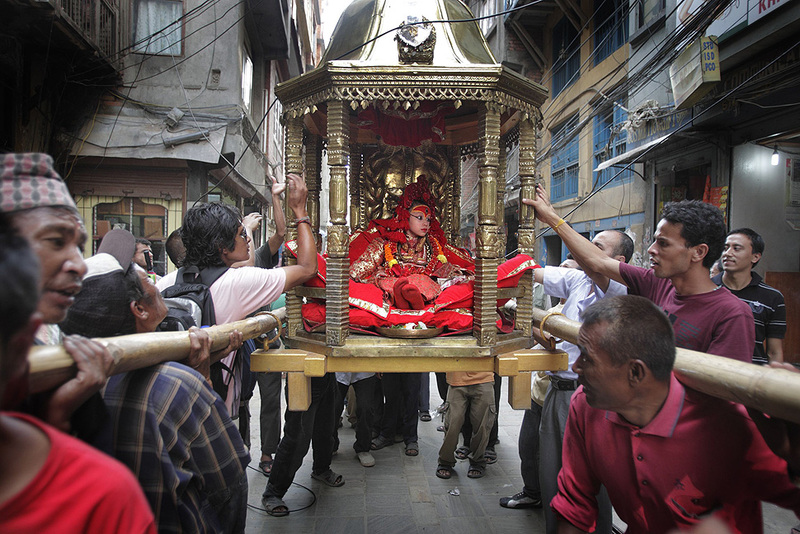 But the most notable and perhaps the unique feature of their religion is the prominence given to the worship of the Living Virgin Goddess — The Kumari. Kumari Puja or “Virgin worship”, is a feature of Hinduism of the greatest antiquity dating back at least to the vedic period.The earliest known reference occurs in a Sixth or Seventh century B.C. in which the sakti (‘divine energy’ or ‘female creative principle’) is adressed as Kanya Kumari. Thus for the evidence points solely to the existance of the goddess called Kumari; there is no information at all concerning the nature of her worship. 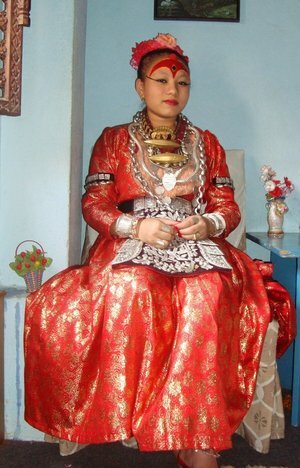 Vamsavali provides a due to the possble origin of the unique practice of worshipping young girls as living Kumaris. 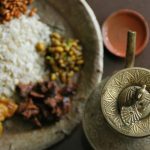 There are many tales of the evidence of the kumari.The history of the kumaris can be analysis in the many of the facts. The most valuable facts are mentioned here as below. Once there was a raja(king) Lakshmikamadeva of kantipur who reigned from about 1024 to 1040 A.D. 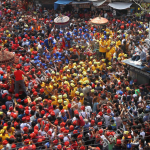 He thought that his grandfather had acqures so much wealth and conqueres the four quarters of the world through the aid of the Kumaris, resolved to do the same. 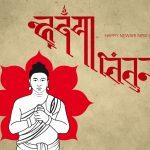 With this intention he went to the Patan Durbar, and having worshipped as Kumari the daughter of a bandya(shakya cast), living in a bihar near the Durbar, known by the name of Lakshmi-barmam, he erected as images of kumari and established the Kumari Puja(“Virgin Worship”). 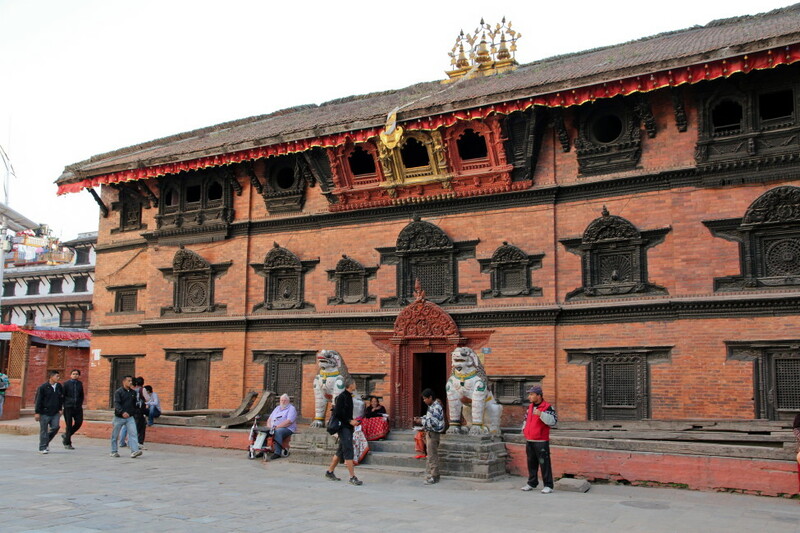 A similar tale focussing on the dice game and subsequent retreat of the goddess into the form of a shakya girl is told in Patan, though the relevent monarch is said to be either Sidhinarasingh(King of Patan”), the seventeenth century monarch who built the first Taleju Temple. The widely known story recounts how kumari as Taleju used to come to speak to Siddhinarasingh in his agama in the palace. He ruled the kingdom in accordance with her advice. Then one day when they were playing tripasa his queen saw them through the keyhole. She complained to the king and when the goddess heard this she told him that she could not come anymore to a palace where she was regarded with suspicion. Siddhinarasingh was worried and asked her if they couldnot perhaps continue to meet if she too some other form.She then told him that she would enter into the body of a young girl whose parents were of a degraded and low proession.Siddhinarasingh himself looked for such a family and he selected the doodah, a section of the Bajracharya caste whose members gather gold-dust from rubbish and melt it down for re-working. 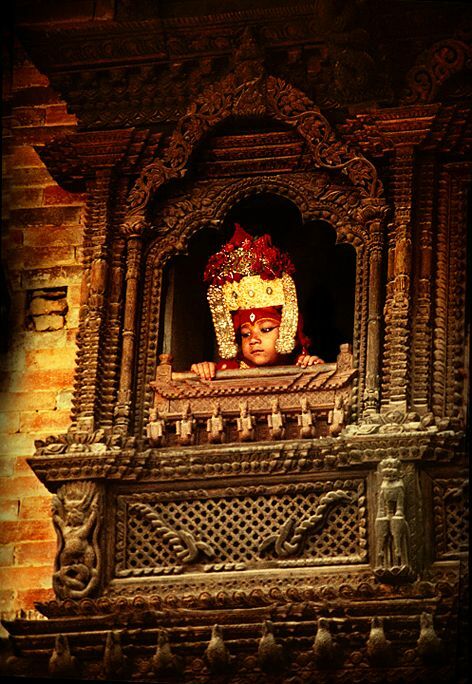 The Kumari who was once the tutelary divinity of the malla kings of patan, is still of considerable importance, especially in her own town. King Siddhinarasingh malla used to play tripasa( a kind of game) with Kumari in his own palace. one day queen saw them playing tripasa through a key hole. She complained to the king and when the goddess heard this, told the king that she couldnot come to the palace where she was regarded with suspicion.The King felt afflicted by the misbehaviour of queen and he beged apolize himself and also requseted her to meet in the otherway.and then kumari let him know that she would take a birth in the middle class family. And house where kumari is borned is known as “kumari Ghar”(kumari’s house). And since the day, the house where living goddess kumari lives is regarded as “kumari ghar”. 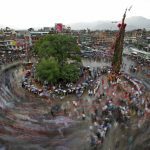 Now Patan kumari has not granted the official house or governmental house yet. She has been living with her family in her family house. The residense of the family house of Kumari is knowm as the “Kumari Ghar”. The next new kumari has her own house as Kumari ghar. 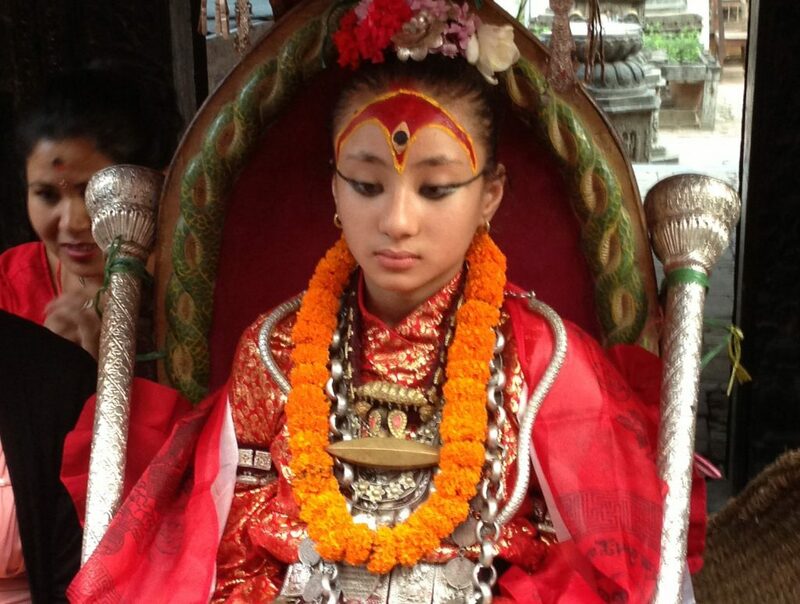 Recent kumari Chanira Bajracharya has being living with her family at the Ghabahal. 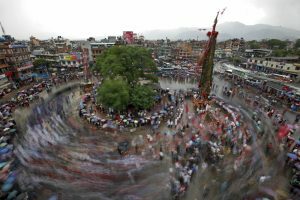 It lies in the central part of the kumari city near by the Patan Durbar Square. 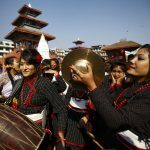 The girl must belong to the Bajracharya clan, a community of goldsmiths, no more than a handful in number. Her family background must be impeccable with a reputation for piety, and the committee studies the candidate for calmness and poise. She must possess all the 32 lachchins (characteristics) of physical perfection. Her skin must be blemish-free, her hair and eyes, very black. Her body has to be sturdy as a Banyan tree, thighs like those of a deer, neck like a conch-shell and tongue, small and moist. The voice will be crystal clear, hands and feet dainty and sexual organs small and well-recessed. Strangely, for a child, she should also have a set of 40 teeth. Her horoscope must match that of the king’s. If the blood-loving Taleju is to reside in her, she must not be repelled at the sight of gore. And to test her fearlessness, the child is pushed into an odiferous room with 108 decapitated buffalos laid out in a sea of blood. Men wearing horrid masks dance among them in an effort to frighten the child, who walks clockwise through this scene of carnage. If she cries out, faints or shows any sign of hysteria, she is immediately disqualified and the next candidate is brought forward for consideration. Spiralling lines on the soles of the feet. Long and well formed toes. Feet and hands like those of a duck (with netlike lines). Feet and hands soft and firm. The body broad at the shoulders and narrow at the waist. Thighs like those of a deer. Small and well recessed sexual organs. Neck like a conch shell. Teeth white and nicely shaped. Voice clear and soft like a duck’s. Eyelashes like those of a cow. A beautiful complexion with white luster. Skinpores small and not too open. Hair-whorls stiff and turning to the right. Head round with cone-shaped top. Body shaped like a banyan tree. Auntie Kumari is still virgin. She was selected and incarnated Goddess Kumari when she was 2 and half year. To the surprise to all whoever knows her and has visited the Kumari house admits there is one more miracle in the world to know how she has deserved the right to be worshipped and remained virgin even at the age of 56. Officially Government denounced her as official Kumari on the only ground that she has grown old and can no longer be accepted as child and selected another one but in practice she remained virgin and maintained her chastity without being menstruated as yet at 56. She is being honored and worshipped as usual.